After a fun demo of a pair of lightweight 120 mm skis at Vertfest, I’d kept an eye out for a sweet deal on a pair of truly fat skis. The Drifter, at 153/128/141 mm, fits that bill. These skis are used, but in stellar shape. The previous owner posted a review here. These skis are almost certainly from Voile’s “zero-camber” sale of 09/10 skis. Durability-wise, the previous owner claimed 70+ days; the bases are in stellar condition given that much use. 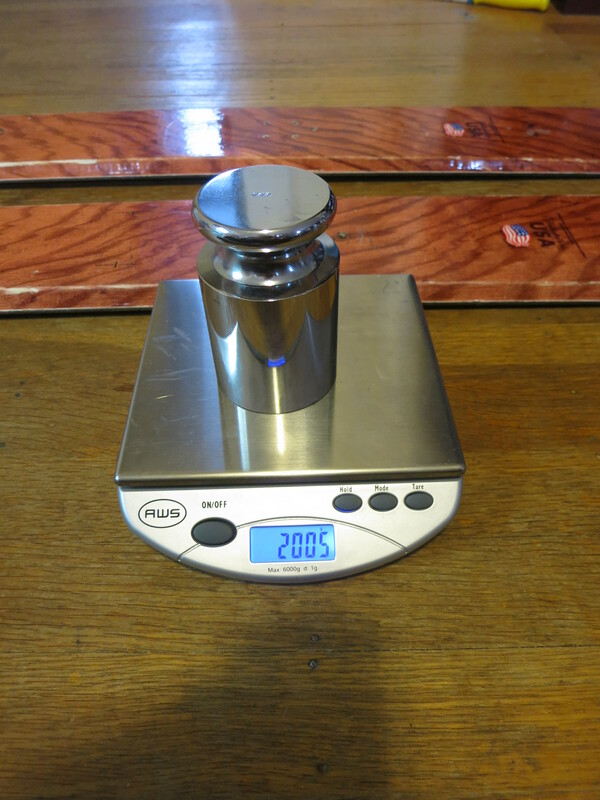 Weights: From the Wayback Machine in April 2010, the 192 claimed weight/ski was 2.11 kg/ski. 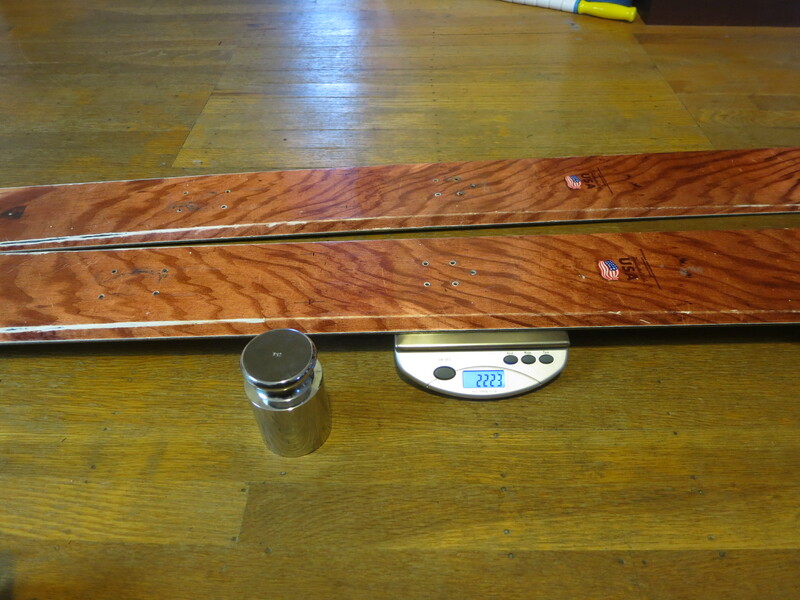 The skis weighed in at 2231 and 2217 g, yielding 2224±12 grams. That’s 5% high, even with binding holes drilled and some wear; perhaps pre-production weights were overoptimistic. The ski dimensions are internally consistent at better than 100 microns, comparable to the amount of material removed by sharpening an edge. I haven’t yet made a major effort toward quantifying ski dimensions, but this is the best I’ve seen. Very nice work, Voile. Repeatability at that level hints at quality in other contexts. 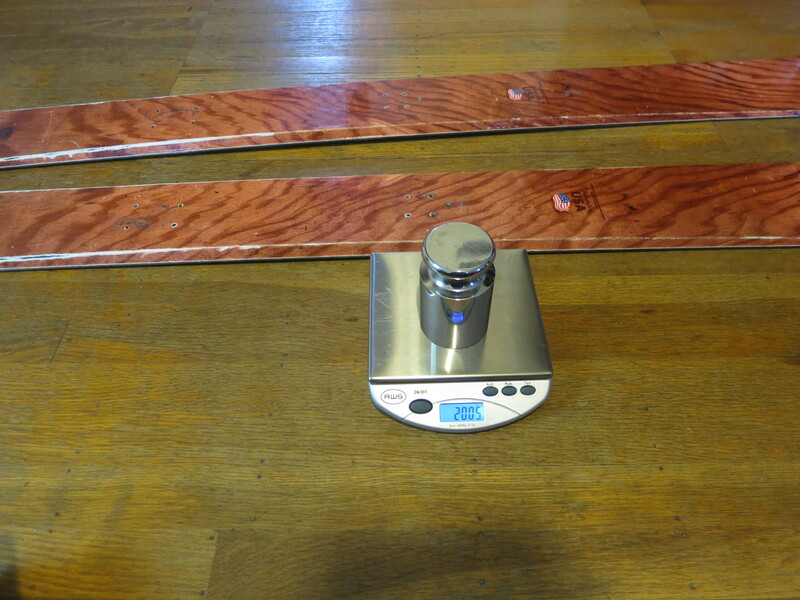 The ski topsheets claim 153/128/141 mm. My measurements give 155.1/127.3/141.3 mm, with uncertainties < 0.1 mm. The ski shovel is so huge, it’s only barely measureable with a 6″ shop caliper! Flex is pretty even/round. Stiffest underfoot, softest in the shovel, as usual. The symmetric wood ski pattern is wonderful. By avoiding any asymmetric graphics, the skis look great no matter which foot they’re on. More manufacturers should keep that in mind. I’m a sucker for the woodgrain pattern too. Edit 2/16/2014: Finally got these skis on snow with 2-8″ of stormday snow atop an edgeable crust. Super fun. Forgiving and confidence-inspiring. The big rockered tip lets you get forward and stay there, just like you should. As maneuverable as my traditional-camber 177 El Hombres, except when the physical length is a problem (tight chutes, sideslipping between trees, etc). I’m used to traditional-camber skis, so the flex feels strange; they don’t want to bounce and pop at all, there’s no strong sense of bowing the ski underfoot in each turn. With short turns, it’s possible to get the ski shovel flexing and carving. Edgehold, at least with sharp edges, is sufficient; be prepared to angulate to find the grip. Large radius turns are a hoot. Guess I’m going to have to get a pair of skins to match these guys…. Edit 2/17/2014: Lordy, what a fun pair of skis. Wide sweet spot, forgiving, fast. Even the tips seem to uncross themselves. Only drawback is the lack of nimbleness when things get tight. Today, with ~2′ of new snow, they were a great tool for the job, outfloating other pow skis. Yow. Never thought I’d like a 192 cm ski this much. Even on skied-flat terrain, they ripped. Edit 2/23/2014: Bought skins on an impulse. Skis break trail well, but they’re long for the tight brush of Snoqualmie. Skiing, they’re nimble, and stop effortlessly, but endless short turns to negotiate thick trees are not their forte. Give them a little room, though, and they love to fly. These skis aren’t damp, straightlining snowmobile whoops on a forest-service road requires attention. These skis are still super fun. Edit 12/22/2015: It finally snowed again, and it snowed a lot. These things crush it when breaking trail, float powder like a dream, and handle tight trees amazingly well. I like ’em so much, I snapped up a pair of the 182 cm Drifters for my fiance. I hope she likes ’em just as much. Stay tuned for the next edit.